Suri fleece is comprised of high-luster fiber and drapes down the animal’s body in a twisted or flat form. It is highly desirable in the fiber market and commands a premium price in the range of four to six dollars per ounce. Hand spinners admire the fleece for its durability and its ease at accepting color through dying. The fashion industry desires Suri fleece because it has the softness of cashmere, the luster of silk and the featherweight and warmth of goose down. Suri fleece can be blended with wool and other fine fibers including silk to be knit, woven or crocheted into highly sought after garments. Fleece is measured in units called microns. Micron counts of suri alpaca fiber can range from the mid-teens to about 30. As a point of reference you should know that a human hair ranges from about 75 to 125 microns in thickness – the higher the number, the thicker the hair or animal fiber. At a Suri Farm, ltd., we strive for dense fleeces with micron counts in the teens to low twenties. In 1998, the Alpaca Fiber Cooperative of North America was established under the auspices of the United States Department of Agriculture’s Rural Cooperative Development Section. With the slow herd growth of Huacaya and Suri alpacas, supplying the garment industry with North American fleece is a project that will take years to achieve. Much more needs to be taken into account when determining the “clip” for alpaca each year. Fiber must be separated by type (Suri or Huacaya), micron count, and color, to name a few criteria. We simply don’t have the national herd size consistently producing top quality fiber of the same characteristic in the pounds necessary for a viable garment industry. 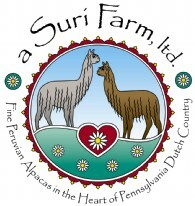 We have been members of the AFCNA at a Suri Farm, ltd. since the beginning of our farm. Some prominent fashion designers and high-end retail stores have begun to market purely alpaca garments. Much of the fleece must be imported to fill the demand. Alpacas were selectively bred for fine, dense fleece 1000 years ago in Peru. Today 85% of the total or about 5000 tons of alpaca fleece is produced each year by Peru.